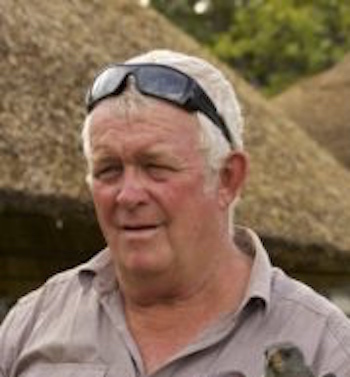 Summary: Trevor Lane established and manages the Bhejane Trust, a nonprofit group that seeks to protect elephants, rhinoceroses, and other large mammals in Zimbabwe parks. Lane and his colleagues have built wells so that animals don’t die from droughts, and they have campaigned against poachers. Lane has been threatened by these poachers more than once, but he remains resilient in helping the police find, arrest, convict, and imprison them. Over the past several years, Bhejane has helped save thousands of animals’ lives. Profile: At least two factors are contributing to the deaths of African elephants, rhinoceroses, and other large mammals in Zimbabwe and neighboring parts of Africa. One is the environment: These animals don’t have enough water to survive. And the other is poaching: People make lots of money from killing large animals and selling their tusks. Trevor Lane is determined to reduce, if not eliminate, both of those factors. Several years ago, Lane and a fellow conservationist established the Bhejane Trust (“Bhejane” is a Ndebele name for “black rhino”), a nonprofit group funded by donors whose primary goal was to monitor—along with other organizations—the black rhino population in the Sinamatella area of Hwange National Park. Since then, however, Bhejane’s goals have expanded, and so have its successes. Soon, Lane discovered that his—and Bhejane’s—assets were much in demand; drilling boreholes was only the beginning. These days he assists the National Parks and Wildlife Authority of Zimbabwe in not only the resuscitation of old boreholes and the drilling of new ones but also the installation of pumps, the transportation of diesel to pumps, road development, fire management, monitoring of game populations, mapping, and, yes, anti-poaching. On the poaching front, the poachers are shooting animals and also introducing cyanide to water holes frequented by elephants. Over the past few years, 240 elephants—as well as hyenas, wild dogs, lions, and kudus—have died from cyanide poisoning. Furthermore, poachers do not take kindly to people who want to disrupt their trade, and they have threatened Lane on numerous occasions.